Clutching at any appearance of control. 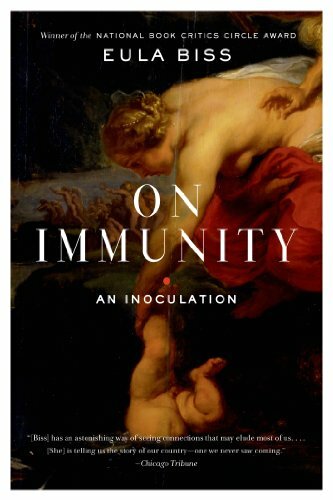 Reading On Immunity: An Inoculation, I am unprepared to be plunged back into the high drama of first motherhood: the sleepless nights, the endless internet articles sent by earnest and well-meaning friends, the googling of symptoms, that sensation of closing the laptop with a deep unease in my stomach. I suddenly remember my daughter, six months old, happily splashing in her baby bathtub as I hovered over her. I remember vague recollections of an article where Johnson & Johnson baby shampoo had been linked to chemicals which might cause cancer. I remember absorbing the information, adding it to the litany of cautions and chastisements that had begun the moment I had learned I was pregnant. Watching my daughter gleefully slap and smash the bubbles, I felt a deep despair settle over me, staring at that tell-tale yellow bottle. Of course we, and everyone else we knew, used Johnson & Johnson baby shampoo. It was the cheapest one available. We were living in low-income housing, surrounded by families hovering near the poverty line. I watched my daughter play in her bath, both frightened and paralyzed by all that I knew. I chose to comfort myself with the blackest of thoughts. Well, if my daughter gets cancer, at least she will get cancer with all of the other poor children. I told this to my husband, wild with futility. He gently suggested that perhaps I needed to take a break from reading articles on the internet. Biss takes this as her starting point in a book that is not neatly categorizable. It is a book about Achilles’ mother, and it is a book about current Western obsessions with self-preservation, especially in regard to our own children. Using vaccines as a metaphor for our fears, Biss writes a series of short, interconnected essays to highlight how—well, how very interconnected our fears, hopes, and bodies are. It is an argument for a very un-American view of science. It asks us to believe in myths, and it asks us to look at the preservation of an entire community instead of the individual. On Immunity starts with Biss in conversation with the many mothers around her. A great majority of them, it would seem, are deeply suspicious and fearful of vaccines. Biss beautifully acknowledges and empathizes with their fears, but she is not content to stop there. She is primarily interested in how and why we choose to localize our fears as a way of gaining control over them. She is also very interested in the negative consequences that can result from prioritizing individual health over collective health. My own mini-experiment mirrored the findings in On Immunity: “Unvaccinated children . . . Are more likely to be white, to have an older married mother with a college education, and to live in a household with an income of $75,000 or more . . . . They also tend to be clustered in the same areas, raising the probability that they will contract a disease that can then be passed, once it is in circulation, to under-vaccinated children.” Biss goes on to explain that under-vaccinated children are those who have received some but not all of the recommended immunizations, and they “are more likely to be black, to have a younger unmarried mother, to have moved across state lines, and to live in poverty.” Biss is asking those with the privilege of opting out to consider the ethical ramifications of our choices. Community health depends greatly on the concept of “herd mentality,” meaning that the healthy majority receive preventative health measures to protect the few that cannot. There is room in the herd for a few to opt out, but there is a tipping point. How do we know exactly what that point is? In many cases, we cannot. And so we choose to gamble, we mothers clutching the heels of our own children, at the risk of neglecting others. On Immunity is deeply theological in this regard. Biss, using her clear, articulate, well-crafted prose, absorbs both the hysteria and the scientific jargon of our day and turns it into a soul-searching metaphor: how willing are we to protect our own at the risk of the vulnerable? We are, as Susan Sontag says, a country which “praises self-interest as individualism.” The effects of this bad theology (for indeed, putting our hope in ourselves and our attempts at self-preservation is a form of faith) are all too evident in many sectors: public education, immigration reform, social welfare programs. What happens when we only think about the good of our immediate family, at the cost of the wider community? What happens if too many make special exemptions for themselves? A thought that would not leave me as I read was this: why do we localize our fears on these minute risks? I see this in my own life. I think about the anguish I felt as I had my daughter vaccinated, on time and as scheduled, how I felt like a traitor to my own motherly instincts. Perhaps it is because the world is a dangerous place, and we clutch at any appearance of control. As Biss writes, the American consciousness fears sharks instead of mosquitos—obsessed with media spectacles that present very little real danger to us while dismissing deadly diseases (such as malaria) which kill so many around the world. Since malaria no longer poses a threat to our children in the U.S., we do not fear it. And, as Biss spells out, the consequences worldwide have been dire. Again and again, Biss returns to this theme: we are not nearly as independent and self-sufficient as we would like to believe. Using science and systems theories, she gently points out some of the graver consequences of our refusal to believe that we somehow have a responsibility to one another. Love your neighbor as yourself, while never explicitly mentioned, is a compelling moral argument threaded throughout the book. Too often our world stokes our predilections for faithlessness and selfishness, creating individuals empowered to self-preserve who still feel very powerless in the face of life. A Christian theology of interdependence is a helpful antidote here. As St. Paul so beautifully put it, we are all different parts of one body. If one area is sick, it affects us all. We cannot afford to dismiss the vulnerable, we cannot afford the luxury of oblivious self-interest, we cannot afford to localize our fears. We are called to recognize that none of us are granted immunity. Greater than any myth of self-preservation, we have a distinct theology: we are all citizens both in the kingdom of the world and the kingdom of God. And it is not safe; but it is a very good place to be. D. L. Mayfield lives and writes in the Midwest, where she currently is a part of a Christian order among the poor. Mayfield’s writing has appeared in McSweeney’s, Image, Christianity Today, and The Other Journal, among others. She has a book of essays forthcoming from HarperOne in 2016.